July « 2008 « R-V There Yet? Well, we made it through the storm. 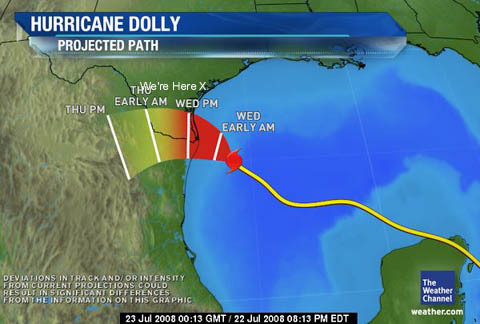 Hurricane Dolly landed about 70 miles north of the original plan which would have taken the route into northern Mexico. As everyone knows, the category II storm made a direct hit on South Padre Island, our location less than two weeks ago. Not only did the storm land north of expected location, it also continued northwest much farther into Texas than expected. The wet and windy side of the hurricane is the northern side of the storm. Guess where we were? We saw quite a bit of rain and 20-30 MPH winds with gusted to about 45 MPH Wednesday night. Corpus Christi didn’t fare as well. They ended up with some 65 MPH gusts and quite a bit more rain. We went to the Rockport shore this afternoon and noticed that the waves were pretty choppy and 3-4 feet high. 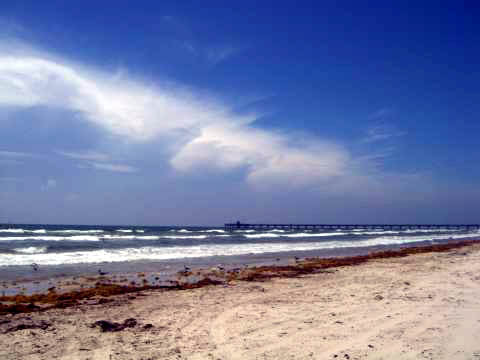 These waves are “bay” waves since the area is protected by San Jose Island, one of the barrier islands along the Texas coast. Anyway, our decision to stay put was a good one. We watched the storm closely and if it had come ashore another 40 miles farther north, we’d have been out of here. On another subject. We are now better prepared to tackle the beach with the addition of our new 6000 lb winch. (The jeep weighs 3400 lb.) 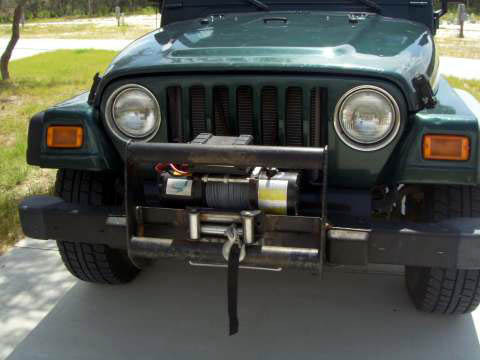 We picked up this winch on Ebay for $189.00, and the mounting bracket was purchased from JC Whitney for $79.00. The mounting bracket was equipped with mounting locations for the front roller. Since we wanted to keep the large bumper guard, we had a body shop install the winch, cut, modify and weld the guard to accept the mounting bracket. Assembly cost was $225.00. The total cost was $493.00 for an addition we hope never to use, except to extricate others from the sand. It’s kind of cool. 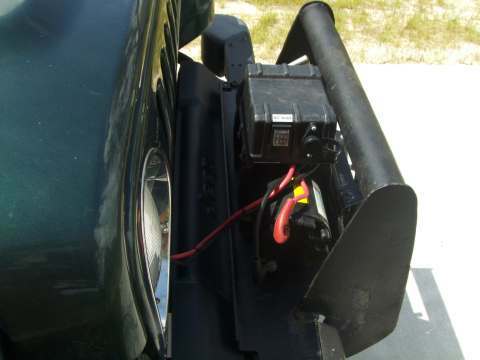 We have a wired remote and a wireless remote/key-chain that will operate the winch. Now the bad news. We had noticed that our fuel mileage on the truck was getting worse when towing. We had lost about 30 percent of our efficiency. 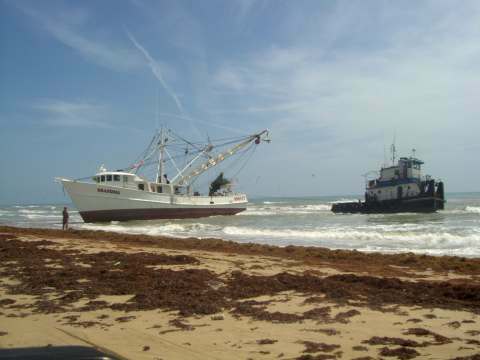 While we were at South Padre Island we noticed that the transmission was slipping when it wasn’t under a load. We dragged our 5th wheel back to Rockport and got recommendations as to transmission specialists that we should visit. We settled on Cottman’s Transmission in Corpus Christi. After describing our problem and their diagnosis, we determined that our Banks Power torque converter had bitten the dust. It was failing to “lock-up” when necessary. A quick call to Banks determined that the warranty on our torque converter had expired a couple of months ago. They wanted $1960.00 for a replacement. If you add the $400.00 installation, we were over $2300. Cottman’s offered to replace the unit for $800.00 including installation for a standard torque converter. Considering our typical use, we elected to replace the Banks unit with a heavy duty torque converter for $1650.00 including installation. The function of the torque converter is critical because our use of an exhaust brake and the TC must positively lock for proper function of the exhaust brake. Well, with one eye on the sky and the other on the television, we’re waiting to greet Hurricane Dolly tomorrow. 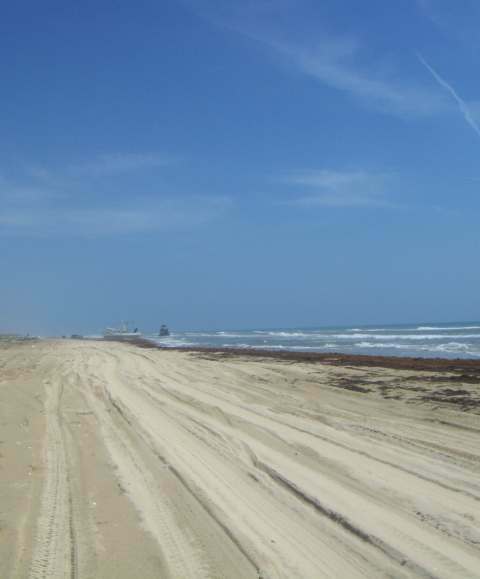 We went to the beach at Corpus Christi today only to find that they had closed the National Seashore. Probably a wise decision. 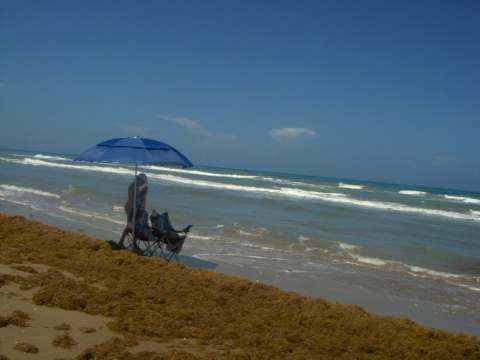 We were able to get on the beach closer to Corpus at the Nueces County Beach. The waves have turned a little choppy and the wind is picking up around here. Looking south toward the storm it is possible to see the monster moving in. The wind rotates counterclockwise around the storm and the winds here have changed from northeast to east during the day today. Looking east it is still possible to see the rain bands forming. According to the reports, our location in Rockport should not experience winds gusting to greater than 55 MPH. With that in mind, we’ve decided to stay put. If Murphy’s Law comes into play and conditions change for the worse we’re prepared to hop in the truck and get out of here. Thursday we will report the wisdom of our decision. THE BEACH – Our favorite place. We were told that the seaweed season in this area runs from February until April. Well it’s running a little longer than that this year. Our first trip up the beach showed quite an accumulation. Each day a little less seaweed was present in the water and the beach widened. Finding a spot to perch meant getting quite close to the shore. On our trip up the beach we found some unusual things along the the seashore. 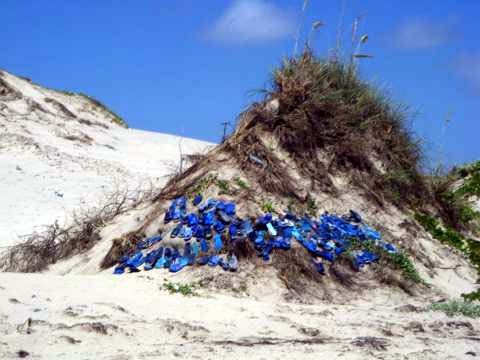 Things like a sand dune adorned with blue flip-flops. A little further up the shore we came across a truck with a 2-story structure behind it. Whoever constructed it placed his tent on the second floor of the structure. I guess he doesn’t like sleeping on the ground. A little farther up the beach we spotted another odd structure. 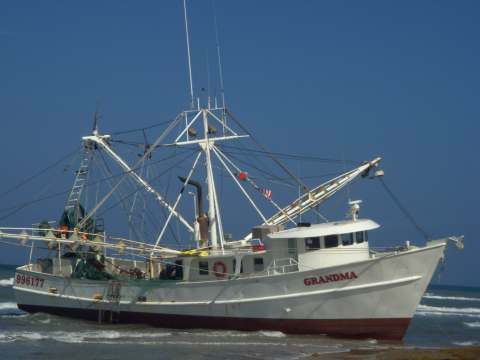 It turns out that “Grandma”, the shrimp boat shown above, had lost power in a storm during a high tide and beached itself about 6-miles north of the last beach access. Grandma was flying both US and Mexican flags. The next day, when we came upon the scene, a tug boat was working to get into position to extract Grandma. Eight hours later it appeared that the boats were in position and waiting for the next high tide that was due to arrive at midnight. Extraction was apparently successful because on the following day both boats were gone. The sand was getting quite soft and harder to pass each day. By Saturday there were several cars that had trouble moving along. We even got bogged down once with our new jeep. We’ve met some great people on the beach and have enjoyed getting a little fishing in. 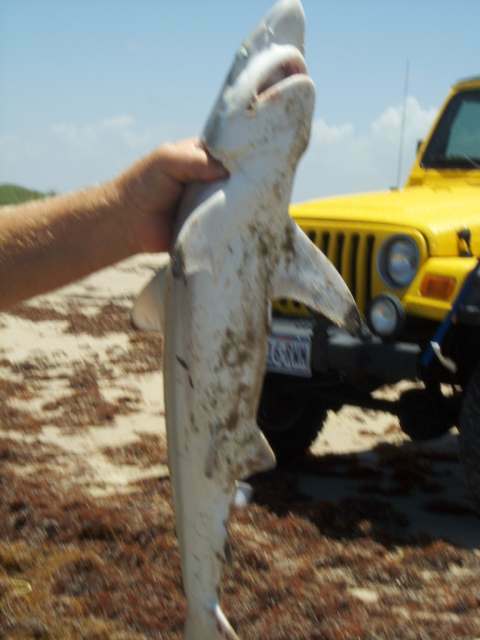 One lady caught a little shark that was about 24 inches long. 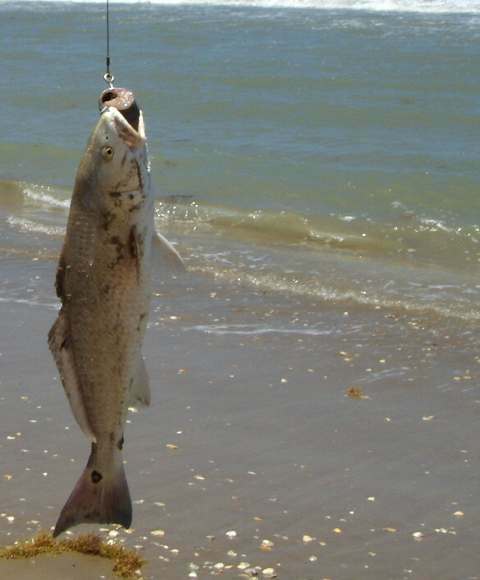 Rick caught a keeper size red drum. Since we didn’t have a place to keep it, we gave it to our friends and they took it to the Dorado Restaurant and had it prepared for dinner. Upon arrival back at the KOA, we spotted what must be the longest RV we’ve ever seen. It is a modified goose neck stock trailer. It must be close to 50 feet long with two slide-outs on the left side. All good things must come to an end. The beauty of it is that we just head off to another good thing. 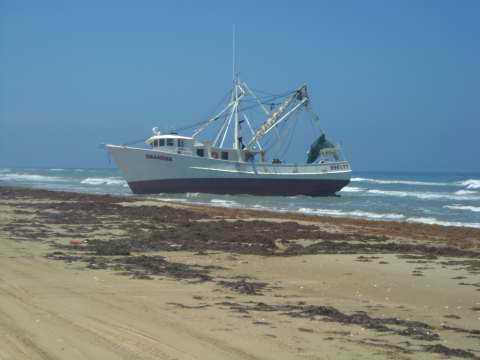 Today we leave South Padre Island and head back to Rockport for a few weeks. 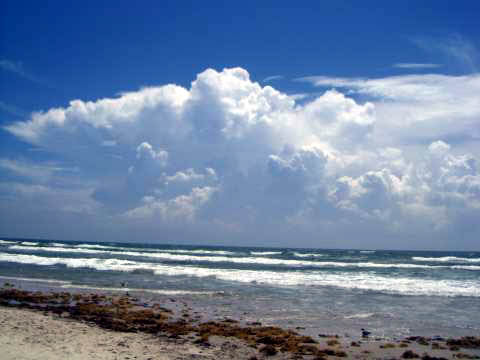 We left the McAllen/Edinburg area and headed for South Padre Island. The weather was a little dreary, but has been wonderfully sunny since our arrival on the island. En-route we passed several orange groves and sugar cane fields. Below is a sugar mill awaiting the next harvest. In the past we had stayed at Cameron County’s Isla Blanca Park. 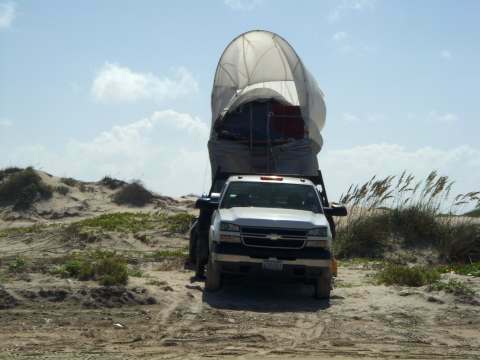 It is a fabulous park with 600 pull through sites and is located at the southern tip of South Padre Island. Unfortunately there was no space available. Isla Blanca is surrounded on three sides by water. 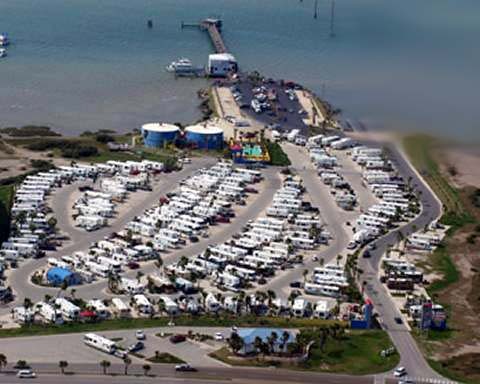 There are a few other RV parks on the island and some across the inter-coastal in Port Isabel. Except for one, none of them appeared to be very modern or roomy enough for our rig. 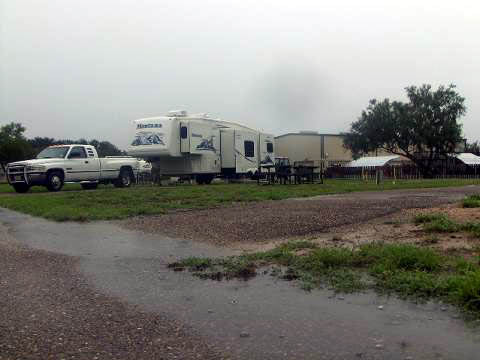 Our salvation was availability at the KOA campground located just outside Isla Blanca Park. (My ladder isn’t that tall so I borrowed the photo from their website.) The KOA is a little pricey, but they have all the comforts and facilities. We have a good spot about three spaces from the clubhouse. We are really impressed with the growth in the area since our last visit about 5 years ago. All the towns along Highway 100 are showing improvements, most notably Los Fresnos and Port Isabel. 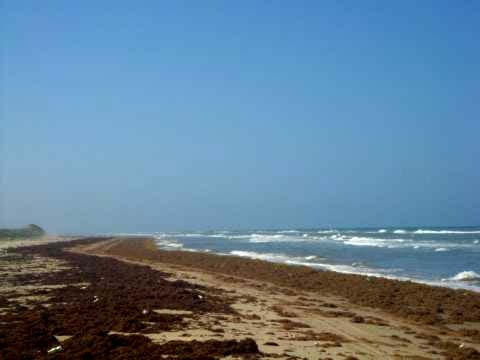 South Padre Island itself has added several new housing and condo areas. The northern part of the island has been one of the last uninhabited beachfront locales in the country. We’re not certain how it will stay this way. For the first time we noticed for sale signs offering property from bay to the gulf. Hopefully this won’t signal the end to one of our favorite playgrounds. We left the Rockport/Corpus Christi area last week and headed to the Rio Grande Valley. 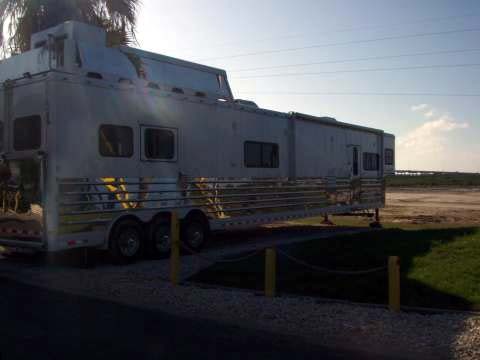 Our goal was to scope out RV parks for use during the cold months of December, January, and February. Some people think we’re nuts because there are over 35 RV parks in Rockport alone and they fill up with Winter Snowbirds who think they are escaping the cold. We have a little different definition of “cold” and are hoping that a few hundred extra miles south will do the trick for us. We’ve had some incredibly dry travels since we left Florida last September. The reason that the Valley farmers love us is because it hasn’t rained here in months and it hasn’t stopped raining since we arrived. We’ve only ventured out on wheels because a few ponds have developed between us and the pool. 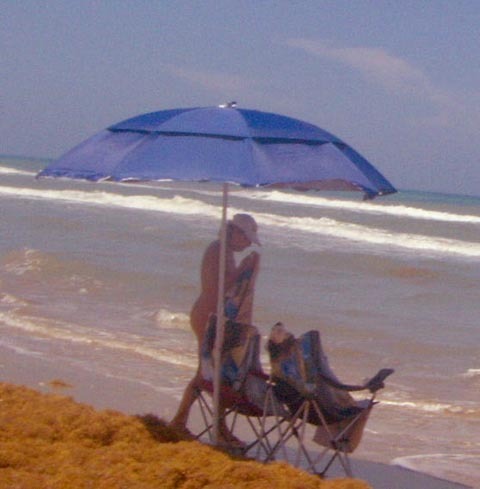 We are moving to South Padre Island on Wednesday, July 9th. It is expected to rain until the 10th. Perhaps we’ll get some decent weather to explore the island the week we will be there. You are currently browsing the R-V There Yet? blog archives for July, 2008.